Firefly Cargo Boxes | Robert Mitchell Jr.
I’m always working and doing things according to the plan. Sometimes I’m such a freak about my goals — writing goals, workout goals, fitness goals, personal goals, business goals — that I forget to take a break. Not this weekend. I decided to do a fun art project on my extra day off. I got the idea last week. Someone at the office was talking about being a massive Dr. Who fan, and about costuming. I mentioned that, if I was going to fall through the costuming rabbit hole again (which I’m not) I’d be a Browncoat. Firefly is in a dead heat with Star Trek (the original) as my favorite TV show of all time. Anyway, I had some wine crates sitting around and I decided to make some Firefly-inspired cargo boxes to put next to my favorite chair. Here’s how I did it. 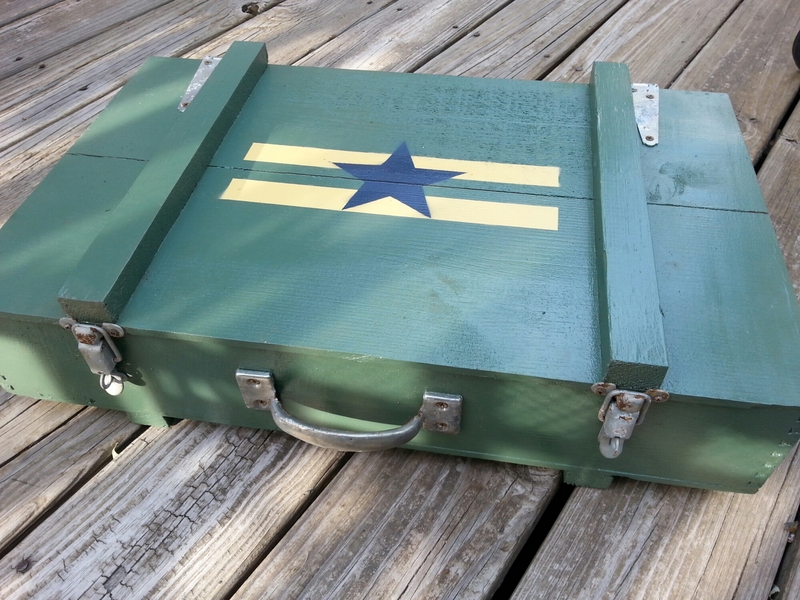 One of the boxes is supposed to be an Independence ammo box, so I glued and screwed a strips across the top and bottom to give it that WWII ammo box look. Then I gave both boxes a coat of mud brown paint inside and out to seal them and hide markings and defects. While that was drying I started distressing the hardware. You can’t have shiny new hardware on boxes that are supposed to look used! I put them in a bath of 50/50 water and bleach and boiled them for about 25 minutes. If you try this, do it outside, be very careful, and use an old pan or a glass one. The ammo box got a coat of green paint. While that was drying, I started making stencils so that I could paint on “CARGO,” some random digits, the blue star, and so forth. The other box I left brown. Next came the painting of the details and the hardware installation. I used spray paint and masking tape. I also found some cool decals online (thanks to all of the other Firefly fans who did the graphic design!). I printed those and put them on with a glue stick. I didn’t have time yesterday, but next weekend I’m going to use a dirty rag and some sandpaper to add a more distressed look. These are actually really sturdy boxes — they were meant to hold heavy wine bottles after all — so I figure I’ll probably use them when I need to haul stuff to zinefests and what-not. Sometimes you have to relax and nerd-out. It’s good for the soul. Look, these things were fun, and they add a nice touch to my relaxing spot. This entry was posted in Martial arts, Mysticism, Writing and tagged ammo, cargo, firefly, nerd. Bookmark the permalink. Pingback: Crafts: Scroll box and Incense Burner | Robert Mitchell Jr.